This is what AO Rafting experienced as the Rim Fire began a week ago. On Saturday, August 17, a small fire started in the Clavey River drainage, a few miles north of the starting point for All-Outdoors’ Tuolumne Class IV trips and the ending point for Cherry Creek Class V trips. On Sunday, August 18, Scott Armstrong, myself, and 10 outfitters from around the country entered the canyon. We were planning a 3-Day Tuolumne River trip beginning on Monday, August 19. As we passed the Rim of the World vista point on Hwy 120 that afternoon (where the fire got its name) we noticed a small amount of white smoke rising from the Clavey River area. The fire did not look very threatening (see photo from my phone below right). Three planes were flying in circles dumping retardant on the smoky areas and it seemed to all of us that this fire would soon be under control. We spent the night at the Yosemite Riverview Inn near the rim of the canyon. The roads into the Tuolumne were closed on Monday so that fire crews could go in and out without delay. On Monday morning the fire reached the north bank of the river and unexpectedly jumped to the south side. This is when things began to heat up. There’s much more fuel (trees) on the south side, and by mid day the sky became dark and orange from the smoke and fire and ash was falling on us and the surrounding area (see photo from my phone at top left). The Inn we were staying in was on the south rim. It did not take long to realize we were in the fire’s path. We immediately began to evacuate. After we were packed and out, Scott headed to our warehouse at Casa Loma, 4 miles west on Hwy 120 with one of the outfitters from North Carolina to remove gear and vehicles, and water down buildings before the fire arrived. One of our competitors has their headquarters at the same location and we wanted to help him evacuate as well. 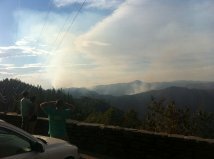 I headed to Sierra Mac’s warehouse (another competitor) a mile west on Hwy 120 with 9 of the other outfitters to help him evacuate as well. This location was in the immediate path of the fire and it was moving so quickly that we only had minutes to get out. By the time Scott got to our warehouse, the fire had reached Hwy 120 and jumped the road. We would be separated by the fire for the next two days. A few minutes after we got to the Sierra Mac warehouse, a Cal Fire Firefighter drove up and told us we had 5 only minutes to pack whatever we want and get out of there. Scott was able to get everything out of our warehouse and we were able to get the most valuable things out of Sierra Mac’s warehouse. I, and the folks I was with, drove out of the “closed” area to the Cal Fire blockade on Hwy 120 and watched the blaze continue up the canyon toward Yosemite. The fire was so hot that it created its own rain clouds that produced ash-filled rain drops and loud thunder above us. Scott left our warehouse to move gear and vehicles further away from the fire that had changed direction and was concentrating most of its force toward us. Later that evening Scott and the outfitter from North Carolina returned to our warehouse at Casa Loma to find that the winds had changed the fire was starting back his direction again. They spent several hours watering down buildings and finally at 1:00 am had to evacuate again as the fire neared the area. Fortunately it never made it the buildings. We hope it never does. For the next two days we helplessly watched the fire grow as it consumed pristine forest and created an atomic bomb like cloud of smoke that reached 40,000 feet. By the time we left on Wednesday afternoon, the small fire we saw on Sunday from the Rim of the World had grown into a massive blaze that was consuming trees as if they were matches and made the world we were in seem like a war zone.